Good Choice Reading: Blog Tour: Character Interview with Julia from Here by Denise Grover Swank! 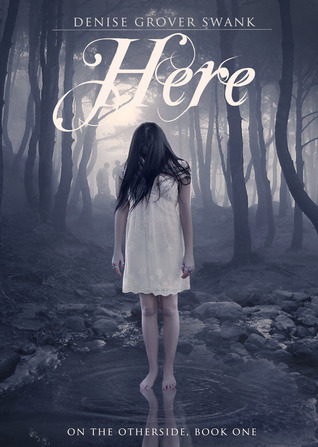 Blog Tour: Character Interview with Julia from Here by Denise Grover Swank! Tell us a bit about what was running through your head when your best friend, Monica, passed away? I was lost. Monica had been my best friend for years and we shared everything. The worst part was going through my grief alone. If she’d been alive, she was the one who would have helped me through it. No, I take that back. That’s the second worst thing. The very worst part was knowing that I’m the one responsible for her death, but I don’t even remember the accident. What were your first thoughts when your teacher Mrs. Hernandez told you that Evan would be your tutor? Confused and suspicious. Evan Whittaker had never paid attention to me ever. Why the sudden interest? If you can go back in time, what is one thing you would change about your life, or anything in general? I’d go back to the day of the accident. I wouldn’t have drove that day. If you were granted three wishes right this instant, what would you wish for, and why? 1) I’d wish that my Monica were alive. I miss her terribly. Even after all this time. 2) I’d wish for my parents to stop fighting. I know it’s all my fault but I don’t know how to fix it. 3) I’d wish for my dad to stop acting weird around me and love me like he used to before the accident. What is your favorite thing to do when you're not in school? When Monica was alive, we’d hang out and watch movies, do our nails, go shopping. Now I’m trying to figure out who I am and what makes me happy. Top three all time favorite music artists? Adele—but Monica loved her, so it hurts too much to listen right now. Sixteen year old Julia Phillips buries herself in guilt after killing her best friend Monica in a car accident. Julia awoke in the hospital with a broken leg, a new talent for drawing and false memories of the accident, in which she dies and Monica lives. The doctors attribute this to her head injury, but no one can explain how a bracelet engraved with her name ended up at the scene of the accident. A bracelet no one has ever seen before. Classmate Evan Whittaker paid Julia no attention before the accident, let alone after. Now suddenly he’s volunteering to tutor her and offering to drive her home. She can't ignore that his new obsession started after his two-day disappearance last week and that he wears a pendant she’s been drawing for months. When the police show up one night looking for Evan, he begs Julia to run with him, convincing her that Monica is still alive. Julia agrees to go, never guessing where he’s really from. I've read Chosen by Denise Grover Swank and really enjoyed it. I haven't read her YA book yet which is this one. It sounds different from her other books but still interesting. I have got to get this book. It gives me goosebumps just thinking about it.